Typical lux meter device for light level measurements (atp-instrumentation.co.uk). Light surrounds us ewerywhere. This is an electromagnetic wave, which is the fastest in the environement. For Earth the main source of light is the Sun. Another source is artifical lightning, created by humankind. In this article I would like to bring an relevant information about the essence of light surrounding us and the ways to measure it. 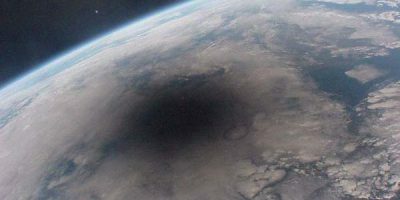 This article doesn’t cover all isues and phenomenas related with light, thus you will find a lot of links at the bottom of this reading. Before I describe the methods of light level measurements I would like to say something about the light phenomenas in general. There is at least a few, knowing for us light phenomenas, which are all around us in day-to-day life. Some of them are confused with another. That’s why I decided to clarify them for everyone. Illuminance is a total luminous flux incident on the surface, per unit area. The luminous flux (called also luminous power) is the measure of the perceived power of light. Important thing is, that luminous flux is adjusted to reflect the varying sensitivity of the human eye to different wavelengths of light. Thus luminous flux is a quantitative expression, which refers to visible light only. Luminous flux is used as an objective measure of the useful light emitted by a light source. The measurement essence points how bright is the beam in particular direction. The luminous flux determines the illuminance value. Illuminance is a measure of how much luminous flux is spread over a given area. It refers to total “amount” of visible light present and the total surface, that is also important. A given amount of light will illuminate a surface more dimly if it spread over a larger area, so illuminance is inversely proportional to area when the luminous flux is held constant. This is analogue to inverse-square law (Pic. 2). The basic illuminance unit is lumen, measuring of the total quantity of visible light emitted by a source. The lumen is comprised of candela – base unit of luminous intensity and steradian – the solid angle being a ratio between the area subtended and the square of its distance from the center. The most important point is, that illuminance is never directly visible as a quantity of light. We only see its reflected image as the luminance of physical surfaces. Our judgment that areas are brightly or dimly lit is actually based on our perception of the light reflected from familiar surfaces, such a white walls. We have to also know, that illuminance does not specify light sources. The illuminance describes the light power incident on a specific surface at a specific location in space. From an illuminance measurement alone we cannot infer the power, size or number of light sources. It is analogous to the “blind” skin sensation of heat on our body that can be induced by the distant Sun or by a nearby light bulb: the sensation of heat tell you nothing about the source. These examples shows the ambiguous way to measure the illumination level. Firstly if we want to describe the light provided by a specific light source, then we must exclude all other light sources from the measurement. If we want to determine the light incident on a specific physical surface, then we must sum the illuminance of all the light sources illuminating it. We can describe illumination in Lux unit. Is good to explain a difference between the illuminance and luminance, because these 2 terms cannot be used interchangeably. Illuminance describes the measurement of the amount of light falling onto and spreading over a given surface area. Illuminance refers to a specific kind of light measurement then. Luminance describes the measurement of the amount of light emitting, passing through or reflected from a particular surface from a solid angle. It also indicates how much luminous power can be perceived by the human eye. This means, that luminance indicates the brightness of light emitted or reflected off of a surface. Luminance is thus an indicator how bright the surface will appear. The irradiance is a measure of radiometric flux per unit area or flux density. 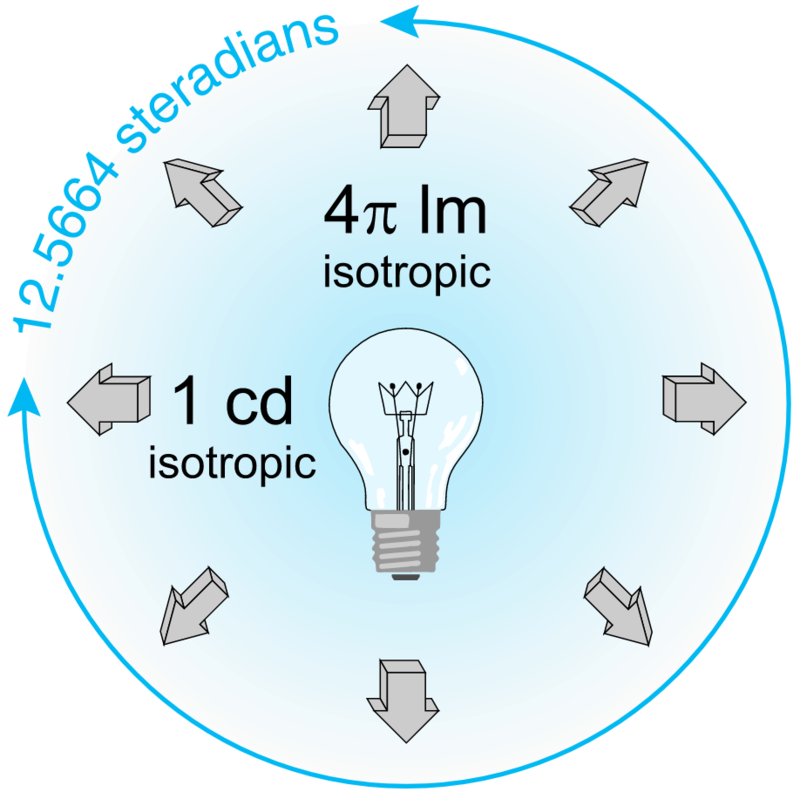 The SI unit of irradiance is the watt per square metre (W/m2). In astronomy often the CGS unit erg per square centimetre per second (erg.cm-2.s-1) is used. 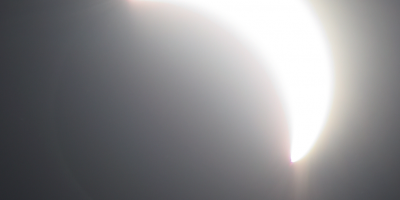 The irradiance has the same physical dimensions like intensity so is often called intensity, however this usage can lead to confusion with radiant intensity. The watt is a unit of power, which is a measure of radiant flux. The power indicates how much energy the bulb will use. Basically the 1/683 watt or 555 nanometre green light provides one lumen. This dependancy tell us, that 1 watt of pure green 555 nm light includes 683 lumens. The relationship a lumens to watts depend on the wavelength according to how visible the wavelength is. For example infrared and ultraviolet radiation are visible and do not count. More information about this you will find in the next section below. Pic. 1 The irradiance mechanism, where: 1 lightbulb is producing 1 candela, next 1 candela emits 1 lumen per steradian in all directions. This 1 steradian has a projected area of 1 square meter at a distance of 1 meter (Ryer, 1998). Pic. 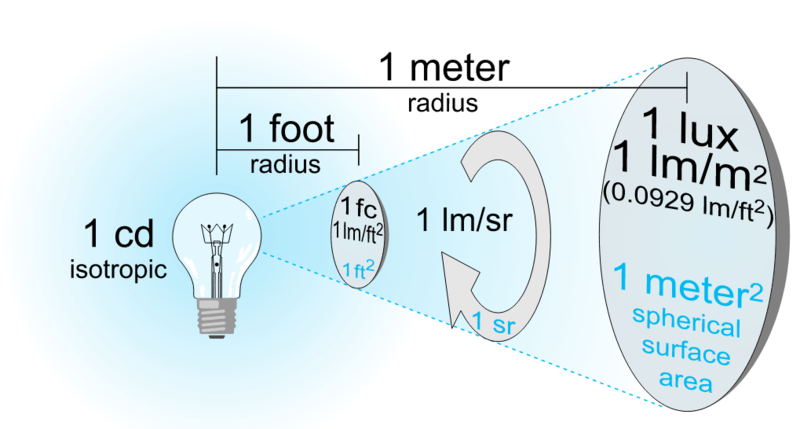 2 The inverse-square law explanation on the lightbulb example, where the beam of light spreads further from the source, but is weaker (Ryer, 1998). Illumination is the deliberate use of light to achieve a practical or aesthetic effect. Illumination includes the use of both artifical ligh sources and daylight. Daylight is sometimes the main source of light during daytime in buildings. Through the daylighting practise we can effectively adjust our internal lighting to maximise a visual comfort or to reduce energy use. Luminosity is the rate of emitting energy in the form of light by the object. We can measure luminosity in Watts. Brightness is the amount of light that we detect from an object. The detection of this energy does depend on the distance to the light source. This light detector can be our eye, a digital detector inside a camera or any other device, that records the reception of light. Remember, that every light detector receives light on a given area, over which it collects and detects light. The basic, SI derived unit for illuminance and luminous emmitance measurements is Lux (lx). The Lux is used as a measure of the intensity of light, as it is perceived by the human eye. Furthermore the Lux measures the luminous flux per unit area. Pic. 3 Total flux output onto a whole sphere (Ryer, 1998). Candela is a basic SI unit of luminous intensity in a given direction and also a base unit of light measurement. Candela emits 1 lumen per steradian in all directions. A basic SI unit of luminance is candela per square meter (cd/m2), which can be replaced by non-SI unit – the Nit. Last important SI unit, described in this article will be Watt, which is the unit of power, and basic SI unit of irradiance. Irradiance is expressed with Watt per square meter. Watt is an unit of 1 joule per second. The maximum value of lumens per watt is 683 and occurs at 555 nm wavelength, which is green. For other monochromatic wavelengths, the lightning efficacy is reduced by a factor according to the sensitivity curve of eye (Pic. 4). For instance, at the wavelength of the helium-neon laser at 633nm, the sensitivity of the eye is only 23,5% (Murphy, 2011). In this case the peak will be at 160 lm/W. Illuminance correlates with how humans perceive the brightness of an illuminated area. The human visual system is capable of recording images across an enormous range of illumination, but on different modes. Due to level of illumination a human vision is different. The eye operates over a large range of light levels. The sensitivity of our eye can be measured by determining the absolute intensity treshold, that is the minimum luminance of a test spot required to produce a visual sensation (Kalloniatis, Luu, 1995). This can be measured by placing a subject in the dark room and increasing of the luminance of the test spot until its presence will be reported by subject. Consequently dark adaptation refers to how the eye recovers its sensitivity in the dark after exposure the bright light. The dark adaptation curve (Pic. 5) has a duplex nature, where in first part cones plays a main role and in second part – the rods. Cones are able to adapt up to 10 minutes. Rods in longer time, up to 30 min. Pic. 5 A dark adaptation curve (Pirenne MH. 1962). Photopic vision – the vision of the human eye under well-lit conditions with at least 10 lx with color perception allowance. The human eye is capable to distinguish objects based on the wavelengths of the light they reflect, emit or transmit. Main role plays a cone cells, that sense light in three bands of colours. The biological pigments of the cones have maximum absorption values at wavelengths of about 420 nm (blue), 534 nm (bluish-green) and 564 nm (yellowish-green). 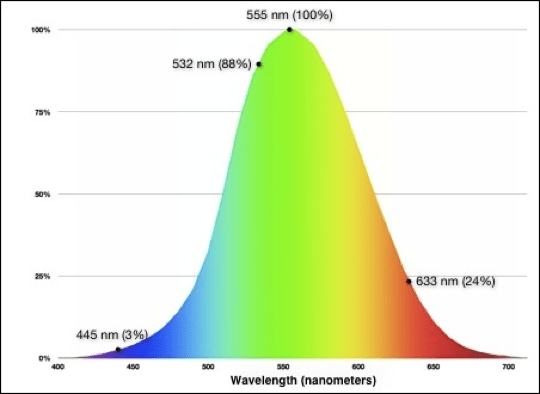 Their sensitivity ranges overlap to provide vision throughout the visible spectrum, where the maximum efficacy is 683 lm/W at wavelength of 555 nm (green) (Stroebel, Zakia, 1993). Photopic vision features also the fastest eye adaptation, up to 5 min whereas the transition from photoptic to scoptic vision can take even 30 min. Mesoptic vision – is a combination of photoptic and scoptic vision in low but not quite dark situations (Stockman, Sharpe, 2006). Mesoptic light level ranges from 0.001 to 3 lx and it corresponds to most night-time outdoor and traffic lightning scenarios. In this vision conditions human eyes uses mainly rops to process light or both cones and rops. 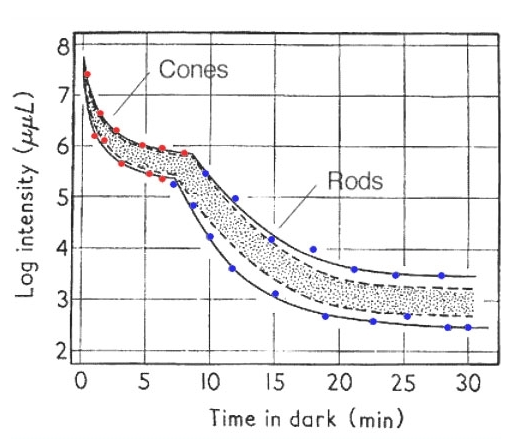 The effect of switching from cones to rods in processing light is called the Purkinje Effect. The Purkinje Effect is the tendency for the peak luminance sensitivity of the human eye to shift toward the blue end of the color spectrum at low illumination levels as part of dark adaptation (Frisby, 1980)(Purkinje, 1825). Practically this is a difference in color contrast under different level of illumination. Scoptic vision – the vision of the eye under low-light vision. In the human eye a cone cells remains nonfunctional in low light conditions. Scoptic vision is produced exclusively through rod cells being much more sensitive to wavelengths around 498 nm (green-blue). Pic. 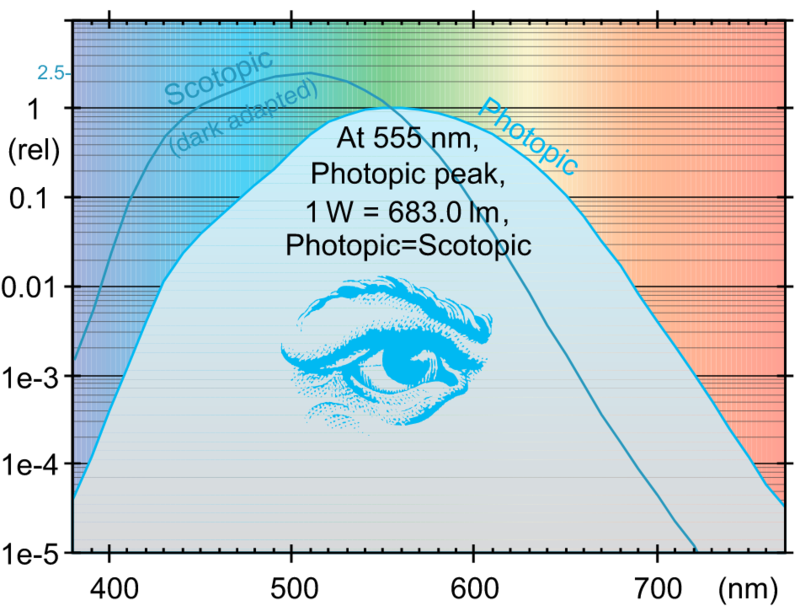 6 Photoptic and scoptic sensitivity curves with photoptic peak marked at 555 nm, which corresponds the equation, where 1 W = 683 lm (Ryer, 1998). The Sun provides a quantity of illumination equivalent to 500 milion bright planets or 400000 full Moons, yet our vision can adapt to light environment anywhere within this range. The simplest way to measure light is to buy a light meter (called also a Lux meter) or install Light measurement Android apps, where most of them are free. 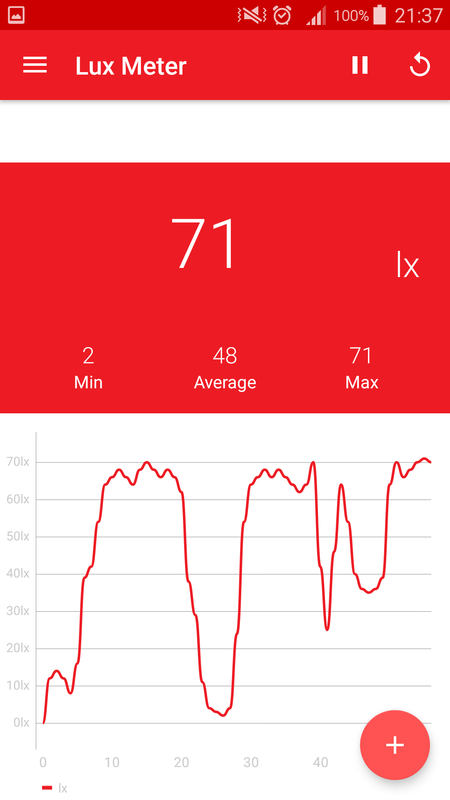 Before I start to wonder how Lux meter apps work versus traditional measuring device I bring a bit information about the typical instruments. Typical instrument, which measures the light level is the light meter. This instrument contains the sensor, that converts the light energy into an electrical charge, that can give the user a reading. Light meter is usually small enough to be hand-held and easily carried about. Pic. 7 A Lux light meter (atp-instrumentation.co.uk). Light meter is simple in use. After taking a cap off the sensor, we should simply place it on a surface where a task is carried out such as the ground. It is important the sensor is placed on the surface as this is where the light is reflected into the user eye and represents the true level of light they receive. The Lux reading should be displayed on the screen. There is a lot of light meters with different scale and resolution. Remember, that Lux meter only responds to visible light. 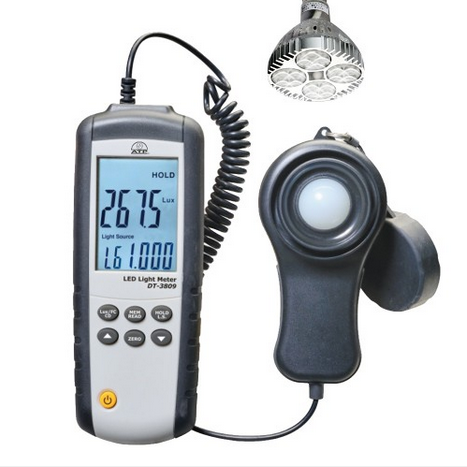 Another instrument is a LED light meter designated for LED lightning (Pic. 8). Pic. 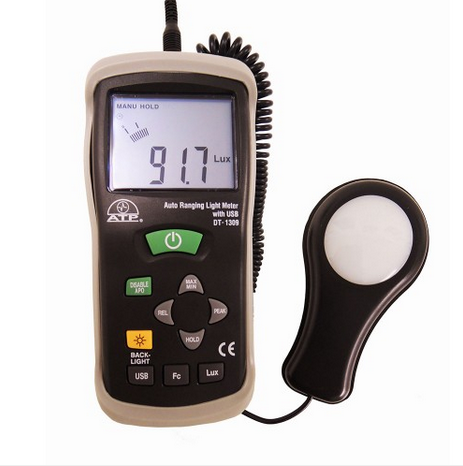 8 LED light meter (atp-instrumentation.co.uk). LED lights produce white light very differently to incandescent lights. Incandescent lights come from classic light bulb, where Light is produced by heating a wire filament to proper temperature. The incandescent lights are omnidirectional unlike to LED, which emits light in particular direction. LED consist of two electrodes (an anode and a cathode) through which electricity flows in only one direction. Diodes are generally made from semiconductive materials such as silicon or selenium, which conduct electricity in some circumstances and not in others. When current passes through the semiconductor material the device emits visible light. LED light meter is useful for measuring and optimizing environmental light levels in a wide range of environments including a rich amount of antropogenic objects. Now Let’s considerate the light measurement Android apps. There is at least a few light measurement softwares, that you can install on your mobile phone. The question is: Are they the same accurate as their traditional counterparts? It depends on the hardware and software. The best software depends on the hardware. It is mainly Galactica and LightMeter. 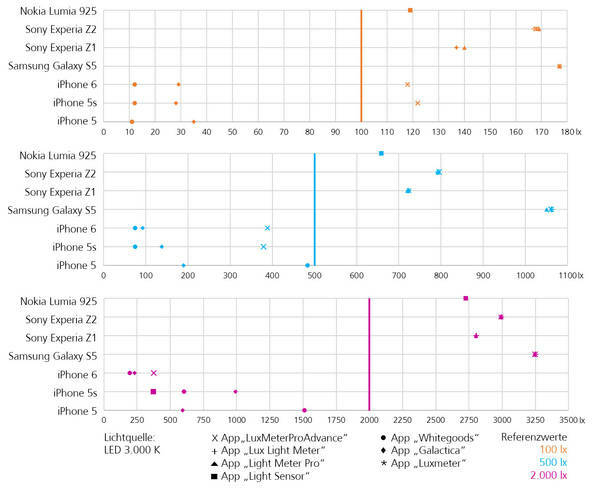 For older mobile phones the deviations from the reference luminance were in part extremely high. For newer the results were better, but still insufficient. The best value brought iPhone 5 with max. 3% deviation. The worst is Samsung Galaxy S5 with 113% deviation (Pic. 9). Pic. 9 The adaptation of spartphones to light level measurements. The mobile phone deviations has been compared to the reference values 100 lx (at the top), 500 lx (in the middle) and 2000 lx (on the bottom). The best values has been reseived for Iphone 5 with 3% deviations below reference value. The worst values has been received for Samsung Galaxy S5 with 113% deviation above reference value (dial.de). A median deviation from the reference value measured by all the apps on the Android smartphones was on average 60% above the reference value. You can do quite well your measurements only when you use a smartphone with the same app, arleady knowing the percentage deviation from the reference value. Remember that you still can face some ambiguities, because these percentage deviations can also vary within the illumination level, especially when the reference value is low (eg. 100 lx), as per the references above (Pic. 9). The answer for this question is, that for serious measurements you will need the professional hardware, which will ensure, that evaluation of the incident radiation is performed according to the brightness sensitivity curve of the human eye in daylight. Light measurement done by smartphone can be used like an orientation with light level changes throughout some period of time. 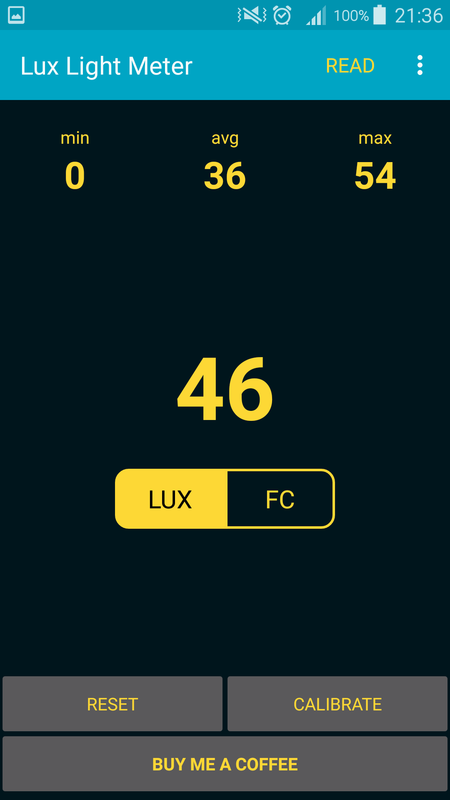 Unfortunately the replacement of a professional Lux meter is not the app manufacturers intention. Therefore apps are not really of any great assistance for measuring professional illuminance and not even any use to obtain a general idea of the illuminance value. 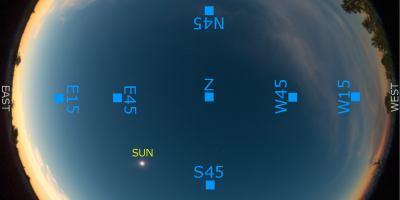 Anyway if someone wants to practise some amateur light measurements in different environments I would like to show a few examples of Android app how they works (Pic. 9 – 13). Pic. 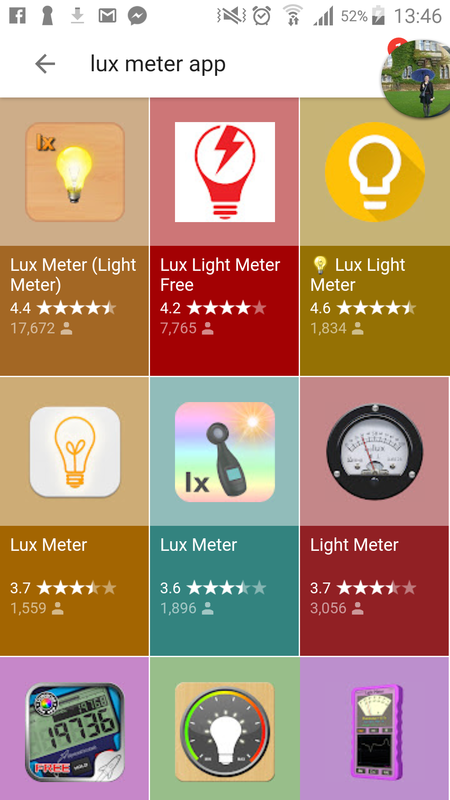 9 There is a lot of “Lux Meter” apps offered by Google Play store. Pic. 10 The Light Meter 2.0 app in use. A small log is provided up to max. 20 measurements. Pic. 11 The one of the “Lux Light Meter” app in use, without log option. Next to the light meter itself important is also a log option. 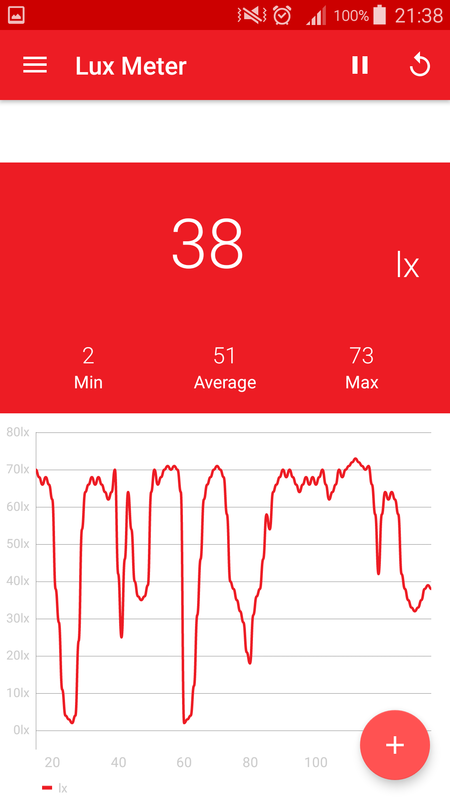 In each Lux Meter app, which I have been used so far there was not a decend log option. I had an result changes in real-time. Only the top middle app “Lux Light Meter Free (The Lux Meter v. 18.08.29)” includes some log in free version, where a first 100 measurements is stored in temporary memory (Pic. 12, 13). Every single measurement occurs, when Lx value changes. Pic. 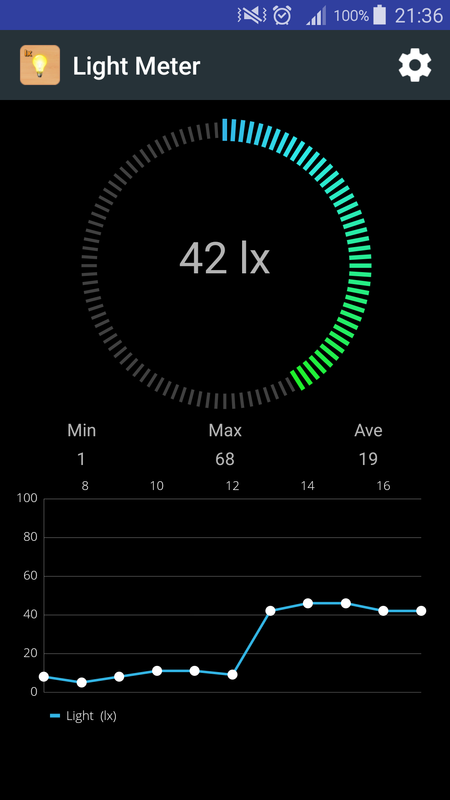 12, 13 The Lux Meter 18.08.29 app with the best log option, which I have seen so far. The log is capable to store up to 100 single measurements. Knowing the basis about light measurement we can wonder about common light levels as we see in our day-to-day life. I am going to bring only a few example values at least in this article, because I would like to describe it widely in the future. Before I do this I would like to show a big plot of main natural sources of light, as we can see in our day-to-day life (Pic. 14). This plot is based on the Footcandles – a non-SI unit of illuminance, where 1 footcandle is around 10,76 lx. Pic. 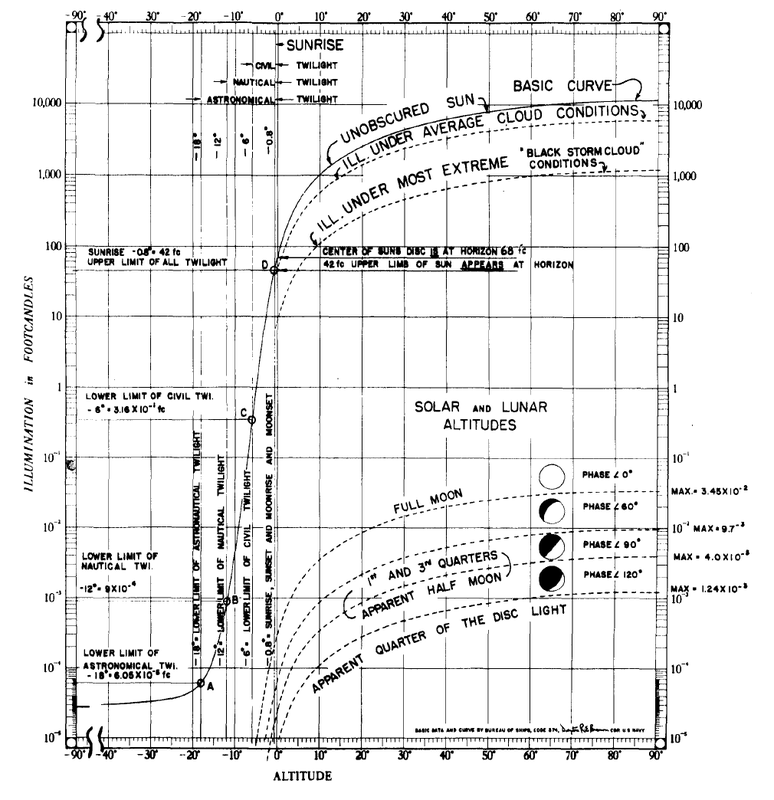 14 A plot of natural illuminance sources (Sun, Moon) against their altitudes above or below the horizon, shown in footcandle unit of illuminance (Fenn et all., 1985). Another natural light doesn’t cover in this plot comes from the brightest planets (e.g. Venus, Jupiter), from the interstellar dust (zodiacal light) and stars (starlight). The illumnance provided by light source on a surface perpendicular to the direction to the source is a measure of the strength of that sources as perceived from that location. For instance, a star of apparent magnitude 0 provides 2.08 microlux at the Earth’s surface. A barely perceptible magnitude 6 star provides 8 nanolux (Schyler, 2009). Comparing it to the Sun being on very opposite end of this line the solar illuminance constant is equal to 129000 lx. A real value of solar illuminance varies due to atmospheric conditions, latitude and period of the year. The luminance of the surface depends on how the surface is tilted with respect to the source. For example when you have a flashlight and you aim it perpendicularly on the wall then it will produce a full given level of illumination. When you put your flashlight on an angle to the surface then Illuminated spot become larger and therefore it receive a less light. 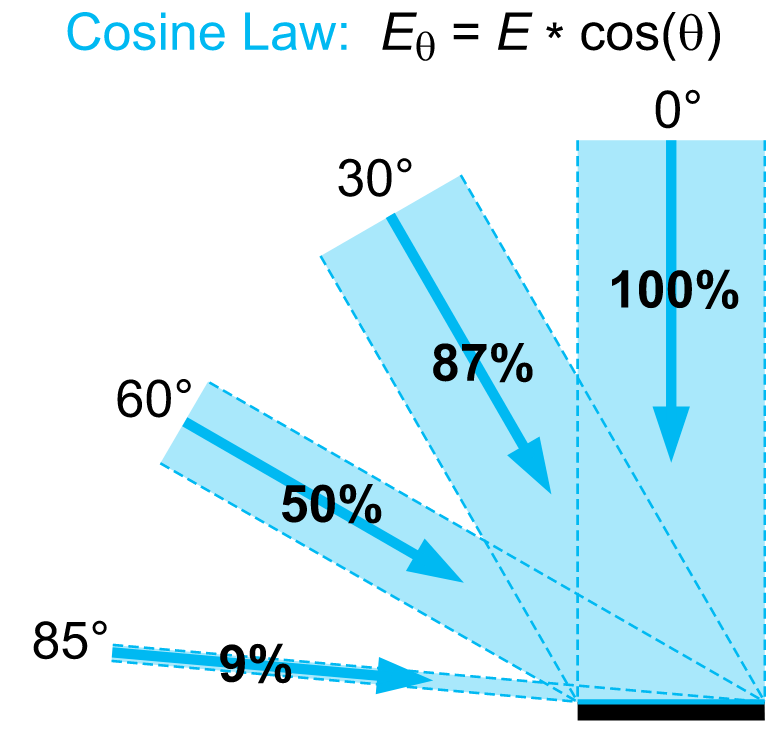 It is described by Lambert’s Cosine Law, where the illuminance and irradiance falling on any surface varies as the cosine of the incident angle (Pic. 15). Pic. 15 Lambert’s Cosine Law with formula above (Ryer, 1998). Anyway the common light levels we can divide on natural and these produced by manufactured sources. For day-to-day life we have a recommended light levels, that we can also divide on outdoor (roadways, sidewalks ) and indoor (warehouses, homes, offices, etc). The outdoor light level is approximately 10000 lx on a clear day. In the building close to window the light level may be reduced to approximately 1000 Lux. In the middle area its may be as low as 25-50 lx. Additional lightning equipment if often necessary to compensate the low levels. The common light level is in the range 500-1000 lx depending on the activity. For precision and detailed works the light level may even approach 1500-2000 lx. There are also another recommended light level indoors examples, but I will describe them in the future. Stockman A., Sharpe L.T., 2006, Into the twilight zone: the complexities of mesoptic vision and luminous efficiency (in:) Opthalmic Physiol Optics, vol 26 (3), p.225-239. IIs measuring LED illuminance with a lux meter accurate?